Enjoy some quality time-out in this beautiful and cozy lodge. 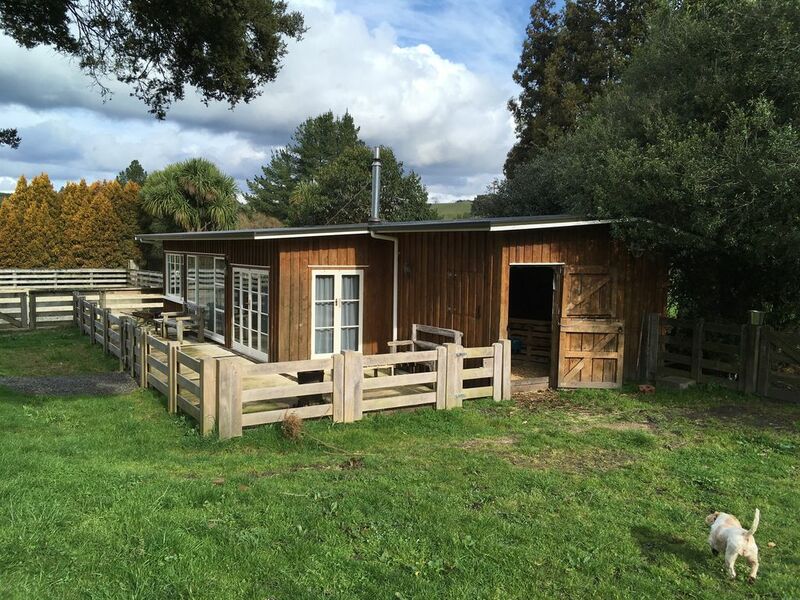 Kereru Lodge is set on a 20acre lifestyle block with farm animals all around. Looking out over the paddocks and hills with plenty of trees, it is very peaceful and relaxing. You can go for a stroll accompanied by the dogs and/or goats. For cold days there is an excellent fireplace and the whole lodge is made of wood. The interior is lovely and warm and has a great feel to it. *Kakahi is a tiny rural village, away from the beaten track, away from any through fare. Still there is some quality time to be spent here. After dark go for a walk through the Te Rena cutting and let yourself be spell bound by the glow worms, it's like a magical fairy tale. Pets are welcome after previous arrangement. We both enjoyed the overnight stay at this property. It was amazing what had been done to make the property comfortable. Very relaxing and peaceful after coming from Auckland where it is so busy and noisy. It was a bonus being able to have our little dog stay with us. She enjoyed watching the horses. The table made from a wool press was just amazing as was the whole decor. The only other comment would be that the shower get etc was completely empty. Otherwise very good and worthy of another stay some time. Perfect break - would have loved to stay longer! We had a great time at Kereru Lodge, it looks even better than in the photos. The care and attention to detail used in the construction was very impressive, we can't way to come back! Lovely one bedroom private rural getaway complete with high quality fittings in what can only be described as peaceful tranquil setting. A must stay. Nice and quiet stay on a farm. Instructions were easy to find the lodge. Lodge was fully equipped for cooking. Would definitely recommend and stay again. This cabin is amazing. So warm. nice place for two to get away and have some alone time. Forget the outside world and just relax. It is in the heart of rural New Zealand, where there is so much to do in the National Park. But sometimes it is nice just to de-clutter your head with quietness. I think this is the perfect place to come and just relax. Carin Bach is wonderful. Lovely situated with a on her farmland with a beautiful garden area. The Bach itself is absolutely Cody, warm and comfortable, with a lovely lounge a perfect and modern equipped kitchen a very good and modern fireplace. It is very, very clean and we loved it there very much. We hope that we have the chance to come back.